To recapture poetic reality in a tottering world, we may have to revise, once more, the idea of a poem as an expression of the ‘contents’ of a subjectivity. Christopher Middleton – Reflections on a Viking Prow. Christopher Middleton, in his essay Reflections on a Viking Prow, talks about how poetic reality can be glimpsed through poems that do not actually contain any overt subjective content but are poems that are functioning as apertures on being; that is, they are structures through which one experiences revelations of being. Stephen Oliver, throwing unabashed ego into service in his proto-modernist book-length poem Intercolonial, presents an alternative approach to the domestic solipsism that renders so much contemporary poetry inert and lifeless, not least of all that which receives the most acclaim. Nothing is held back in Intercolonial. Poundian ‘copulas of agglutination’ are baroquely parcelled, and sometimes ignite into luminous nodes that blaze so as to light up great swathes of the self and its philosophical inclinations. Time and space might collapse and become one and the same – or Zum Raum wird hier die Zeit, as Wagner’s Grail-questing Arthurian opera Parsifal has it. With Intercolonial, Oliver is the poet as Parsifal, albeit one formed in a lustier and less youthful mould. Wellington shares, as it were, postcodes with the castle of Monsalvat, home of the grail and its knights, where time is space and space is time. These are highbrow attributions and comparisons, but I doubt that Stephen Oliver would shy away from them. He has made for himself – and us – a weighty oeuvre. His approach is Joycean in manner, word-tumbling; recruiting the ancient Greeks, and tracing substrata below a humming verbal surface: the pull of Ariadne’s thread, a flurry of Socratic daemons, the weight caught on fate’s fishing line. Lifting off from South Pacific shipping notices of the late Victorian era, and the kind of poetic genealogical inference exemplified by Herman Melville’s great-grandson, the wide-ranging novelist Paul Metcalf, Intercolonial moves from the presentation of seismic or other deep-lying forces, to personification of these forces, to the equation of personal psychology with inexorable geological processes. Each stratum, be it of time or place or of both, is parcelled in discrete episodes. Only after one has finished reading the whole book can these sections be felt to intersect or mingle with one another so as to allow ‘meaning’ to emerge. Oliver leans on juxtaposition, the modernist technique par excellence, but the planes being brought to bear upon one another – discrete sections of the poem – are often too large and unwieldy to create the necessary sparks for casting elements in a new light. Oliver – as is his wont – often seems more to be dowsing than digging; to be deliberately more speculative than evidential; more fantastic than wonderful. What dominates is the bravura of ambition rather than its achievement. The impact and subsequent reach of Intercolonial is often frustrated by esoteria, diffuseness and digression. Even so, amid questionable gestures towards the sublime there are long passages of excellent writing, the like and quality of which readers would struggle to find elsewhere. His grasp of history allows Oliver to make associations that are at once private – of course, the exclusively private is so wearisome! – and public. Fortunately the balance between the two tips in favour of the latter, which is to say, in favour of that which the reader can take an interest in and become caught up in, in the fullest most literal sense. Affinities, traced across vast distances of time and space, are often deftly and tellingly done. But these connections sometimes get obscured by Oliver’s admittedly gorgeous particulars, irredeemably novelistic insofar as they serve not significant particularity but sensuous verisimilitude. Then there’s writing like ‘Ron, the Brooklyn bodgie, fires up his Ford V8 Coupe / (dark blue) no piston slap, revving hard at the break of day’ – remove the line break and this could be from the ‘semi-autobiographical’ fiction produced by Creative Writing graduates the world over. Even of the good stuff, there is much in it that is fat (admittedly delicious, in small amounts), which could have been flensed from Intercolonial’s strong bones. At his more splenetic moments, which, as with most poets, are his least attractive, Oliver comes across as a cranky Tory modernist. His simultaneities – despite what I take to be a form/content mismatch – however, suggest conciliation to be his most deeply held agenda, which is to say: allegiance to coherence. But all in all, integration is hard work. And this difficulty is increased by the resistance to the reader on the part of the poem. To read Intercolonial is to feel cramped, despite the greatness of the swathes it undoubtedly cuts through time and space. And Oliver can be so much better, so much more exciting, demanding the imperative that you read him. His Harmonic, for example, is a book in which Oliver consistently puts on show his adeptness with the kind of open form that would have been much more suited to the material of Intercolonial. Instead, his choice to go with relatively self-contained quatrains, which are in turn parcelled into discrete sections as per locale or time or character, works against the thrust of his thesis, that this-then is here-now. 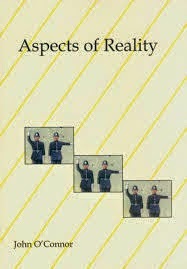 Aspects of Reality is the second of John O’Connor’s books I’ve reviewed for Landfall Review Online, the previous one being Cornelius & Co: Collected working-class verse 1996—2009, in which I found much that warranted praise, especially the way in which its author married scrupulous intelligence to indefatigable solidarity with its working-class locus, a marriage that sometimes flamed into remarkable lyrical florescence. While Aspects of Reality maintains O’Connor’s high standards as per his familiar modus operandi, this present collection doesn’t rise as far from the workday ground that its predecessor did. Whereas Oliver’s concern appears to be with depth and place, surface and space seem to be what matter for O’Connor. Snipped from syntax, the confetti of words and phrases free-fall through a stifling non-specific milieu; things are said, more likely overheard, and at some time or another, or maybe both and more besides. Things happen ‘somewhere’ – ‘somewhere’ in this book is a word most telling in its nostalgia for the sentiment of proximity. From the first poem: ‘somewhere the sun is shining & / doctors greet their patients with a professional smile’ (‘A Bridge of Sparrows’). Over on the very next page, from the second: ‘Somewhere lovers are sighing & / persimmons overhang the factories’ (‘The Ukulele Club’). Often, too, simultaneities are given a pseudo film-noir frisson with a strategic ‘meantime’ or ‘meanwhile’. Simply, something happens somewhere, and sometimes somewhere else, at the same time. O’Connor’s poetry is a telling instance of imitative form. Impressionistic to a fault, it purports to a realism characterised by fragmentation, atomism and the privileging of space instead of time; verbalised snippets occur in the perpetual present. If there were a market for what O’Connor is selling, he’d have cornered it; he has his shtick so well down that one can readily imagine him producing poems of this ilk as a butcher snips off successive sausages. The quality is unfailing from poem to poem, but the flavour is uniform and it is a flavour readers of O’Connor’s poetry know well by now: grass-roots and blue-collar, with a desperate air of misapprehension and with respective parties standing on their dignity in the face of blank stares. Yet, as always, O’Connor demonstrates a virtuous commitment to craft, which never fails him. His comic chops are also in pleasing fettle. As mentioned above, what’s sad for me is the almost complete absence of his lyric mode, so moving in his previous collection Cornelius and Co. There, the force of occasion impressed itself over countering exigencies of technique, poems in which syntax was itself telling, or trying to tell you. Here one is confronted by capitalised LANGUAGE – literally the word ‘language’ – rather than the flesh and blood it seeks to represent. Incongruities between what seem to be an arbitrary ‘this’ and ‘that’ are relentlessly catalogued, to such a degree that it comes across as more than a touch obsessive, and occasionally even hectoring. The last poem in the collection, though, ‘Blues for Cousin Sylvia’, is practically free of the harness of dogma and doctrine, while also being the most manifestly (and moving and effective) instance of ‘open form’ in the book. It wholeheartedly makes a case for itself. ‘Blues for Cousin Sylvia’ shows O’Connor at his best: light-footed and even-handed, juggling a drama of broken hearts with enviable compassion and perspective. It demands to be read, and reading a poem that’s this good, deeply caught up in its occasions of making but at the same time succeeding in transcending them, makes me feel joyous to have such poems in my life. Such writing encapsulates emotion with an impressive power. ROBERT MCLEAN was born at Bethany in Christchurch, New Zealand in 1974. His most recent publication is a chapbook-length poem A Graveyard by the Sea (Cold Hub Press). He lives in Lyttelton on Banks Peninsula.